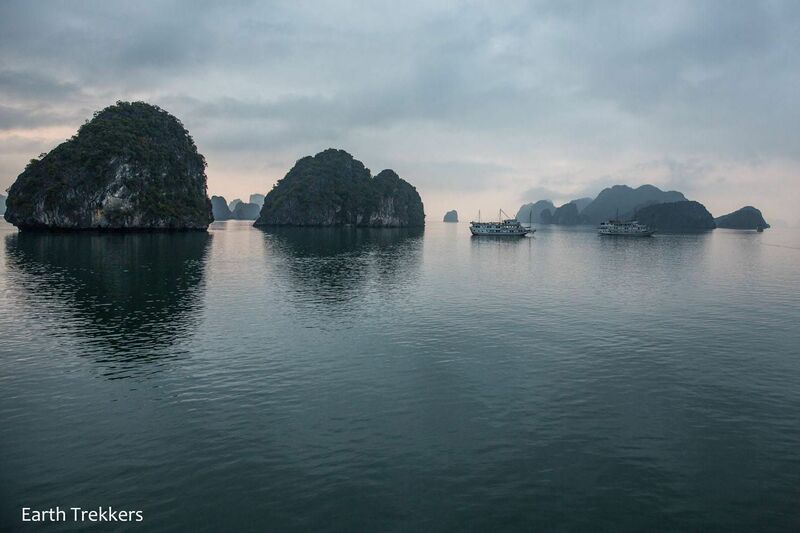 The grand finale of our tour of Vietnam was a three day cruise on Ha Long Bay with Galaxy Cruise Lines. 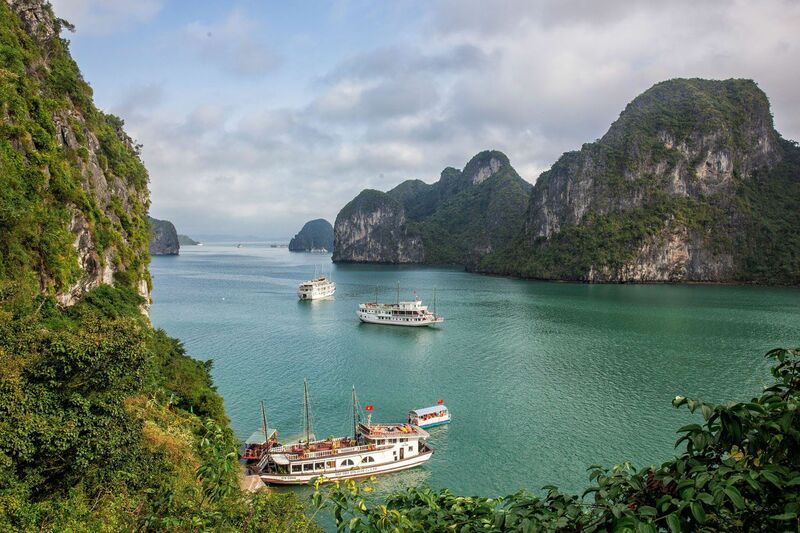 Ha Long Bay is one of Vietnam’s most famous sights…thousands of small limestone mountains filling the bay, not far from the South China Sea. This is a popular tourist sight and another UNESCO World Heritage Site, attracting thousands of visitors every year for day trips or multi day cruises around the bay like us. This was something that Tim and I were really looking forward to. 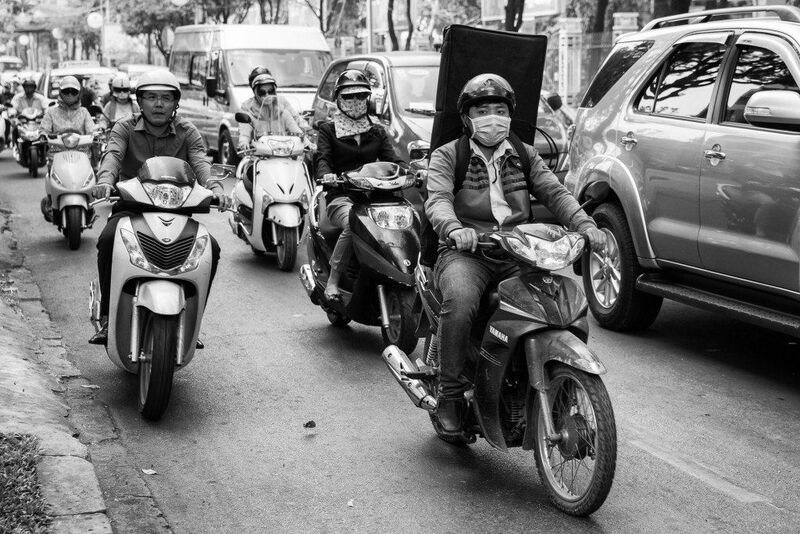 Our trip began in Hanoi. At 8:30 am we were picked up by a Galaxy Cruise shuttle, joining approximately 14 other people on board the van. 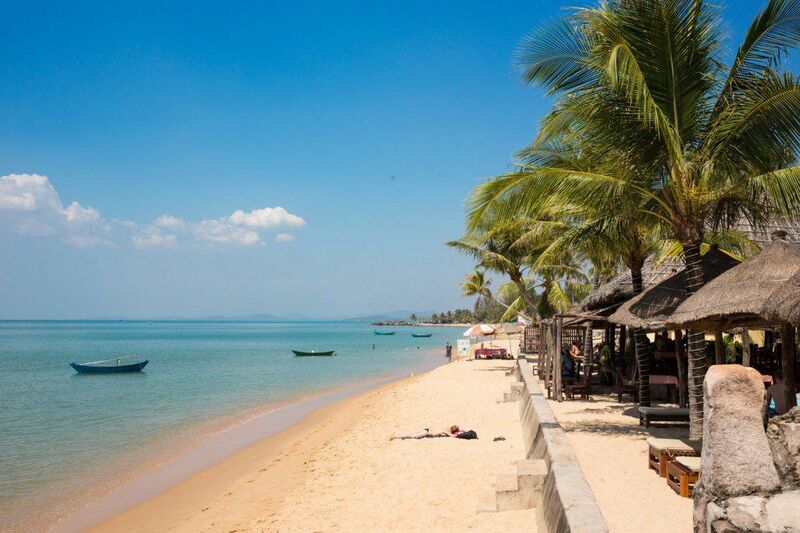 We drove east towards the Vietnam coastline for four hours, arriving at the pier at 12:30. The drive was very scenic, taking us past more rice fields and small towns. From here, a tender, or small shuttle boat, carried all of us 150 meters to our Galaxy Premium cruise ship. Once on board, we were given a few minutes to explore the ship before being served lunch. 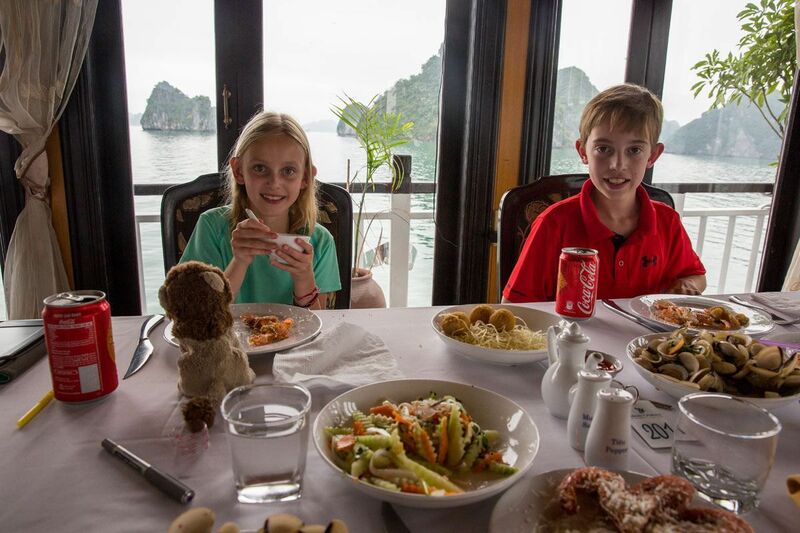 In the dining area, a room surrounded by windows so we would not miss those spectacular views of the Ha Long Bay islands, we ate a Vietnamese lunch of meat dishes, seafood, and vegetables, with fruit for dessert. After lunch everyone got settled into their rooms. Tim and I splurged here, reserving the Honeymoon Suite for the two of us and a twin room for Tyler and Kara just across the hall. Normally we do not book such fancy accommodations but we wanted this experience to be as nice as possible. This would also be the first time that Tyler and Kara would sleep alone in their own room since starting this trip. All four of us were thrilled with our rooms. With the Honeymoon Suite we had a slightly larger room with larger windows. Most rooms are on the bottom deck with small windows and less visibility. Our room was one of four on the upper level, the advantage here being better views out of our windows. 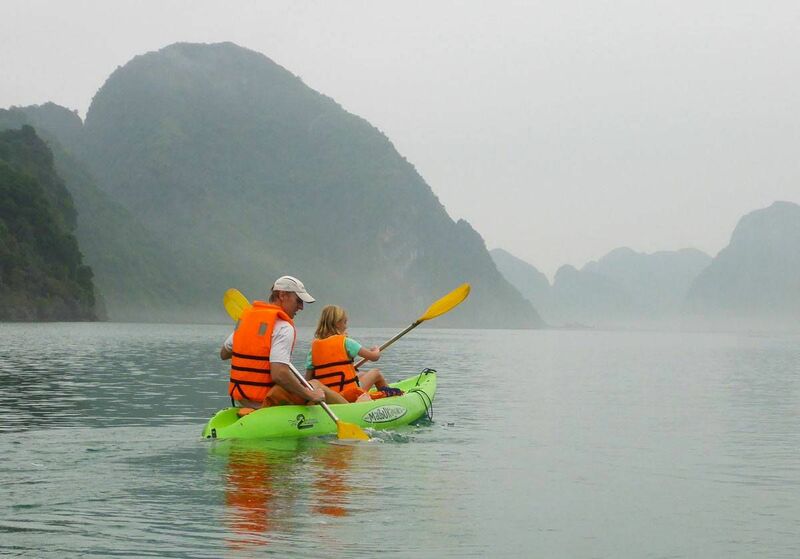 After cruising a short ways through Ha Long Bay we arrived at our first excursion, kayaking in the bay. 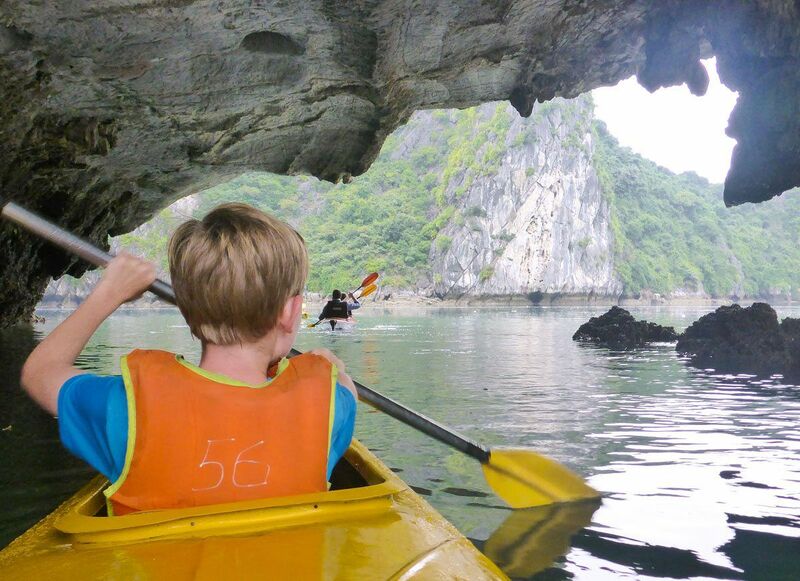 We all paired off into bright yellow kayaks for a one and a half hour journey through the bay and nearby wet caves. The skies were overcast, as they had been all day which was a bit of a downer, but this type of weather is to be expected in February. 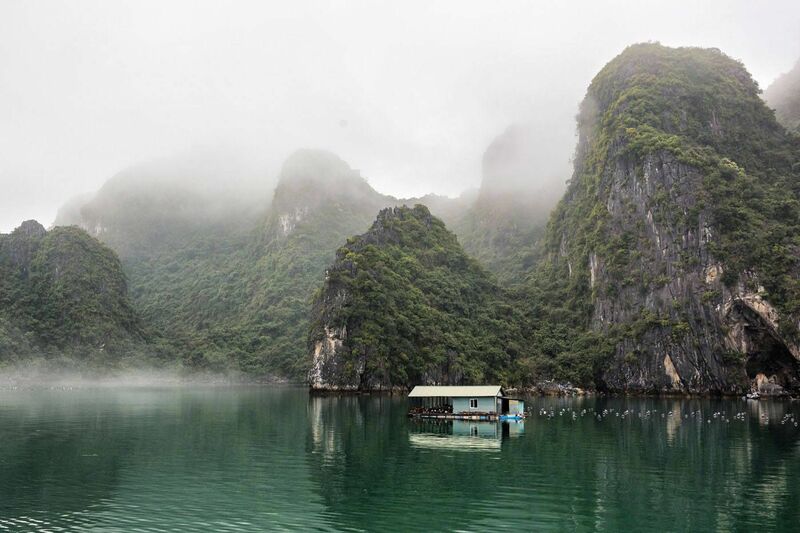 The winter months are Northern Vietnam’s rainy season, almost permanently covering the area in a blanket of clouds and mist. We still had two days to go so we had plenty of time to be hopeful that we might actually get to see the sun. Following the kayaking tour and a quick shower, those on board who were interested were taught how to make spring rolls. Tyler and Kara each made an attempt but quickly got discouraged. Each of them expected their spring rolls to look perfect on their first try. Tim and I had fun with it. It’s so simple and I’m definitely going to make spring rolls once we get back home. 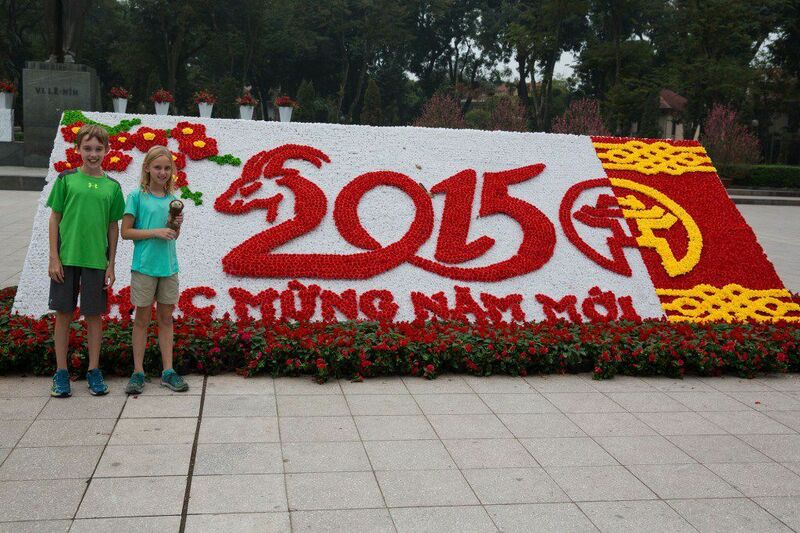 We ate the spring rolls, drank Dalat wine (Vietnamese wine) and then were served dinner. Dish after dish of food was brought out…rice, fried vegetables, prawns, meat and pork dishes, cabbage, and even special food for Tyler. While booking this cruise we made Galaxy Cruise Lines aware of Tyler’s peanut allergy and they did a great job providing him with alternative options if anything with nuts was served. Following dinner anyone on board had the opportunity to go squid fishing or sing karaoke. Our tired family passed on both of these, instead relaxing in our very comfortable rooms. Upon waking up the next morning we were greeted with foggy skies. The fog was so bad that we could barely see the mountains that were not even 100 meters away. It was very disappointing but it could have been worse; sometimes the fog is so thick that the events for the day are cancelled. 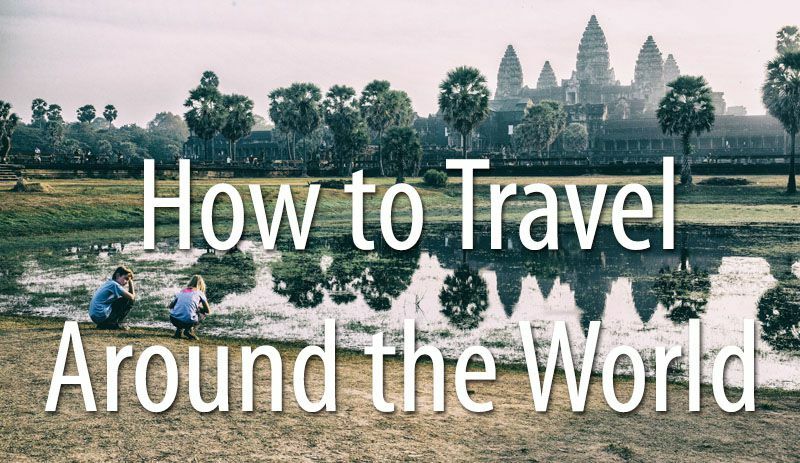 Today, we could at least stick to the original itinerary. 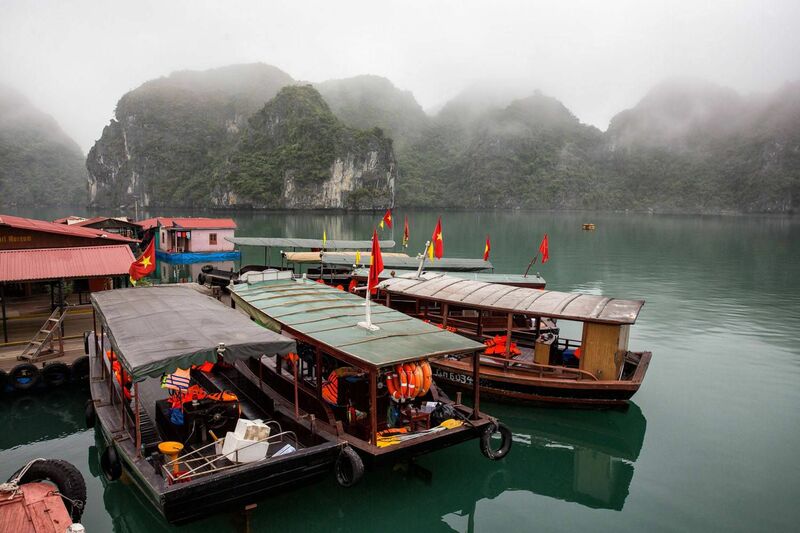 We boarded a smaller day boat to take us to a Pearl Farm and Lan Ha Bay. At the Pearl Farm we learned about different species of oysters and how pearls are made. Afterwards, we went on another short kayaking excursion through one of the nearby lagoons. From the Pearl Farm we cruised through the Lan Ha Bay and out towards the South China Sea. Even though it was foggy and totally overcast, it was still very beautiful. On board the boat we ate a fabulous lunch of fresh seafood and vegetables, by far the best meal we ate on the entire cruise. And after lunch the sky began to brighten, just enough to give us hope that we may actually get to see the sun. By mid afternoon we reached our final destination of the day trip, a spot to go swimming. Our family was not very excited about swimming here because of the cool temperatures and the amount of trash in the water. The amount of trash was a little better here, but after watching trash drift by our boat all day none of us were interested in swimming in this water. Instead of swimming we kayaked around the area, visiting the small beaches and looking for shells. 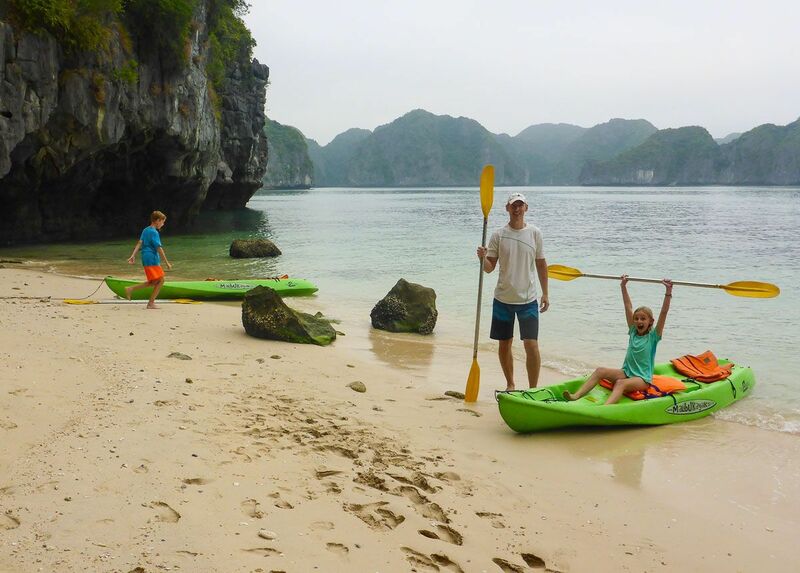 This was the prettiest place we went kayaking while in Ha Long Bay, and exploring the beaches, even though they were very small, was a lot of fun for Tyler and Kara. The skies continued to clear and off in the distance we could see sunshine! This area is beautiful, with its limestone cliffs and small beaches. It looked a lot like Krabi, Thailand. All of us had lots of fun kayaking and today’s day trip was the highlight of our three day cruise. 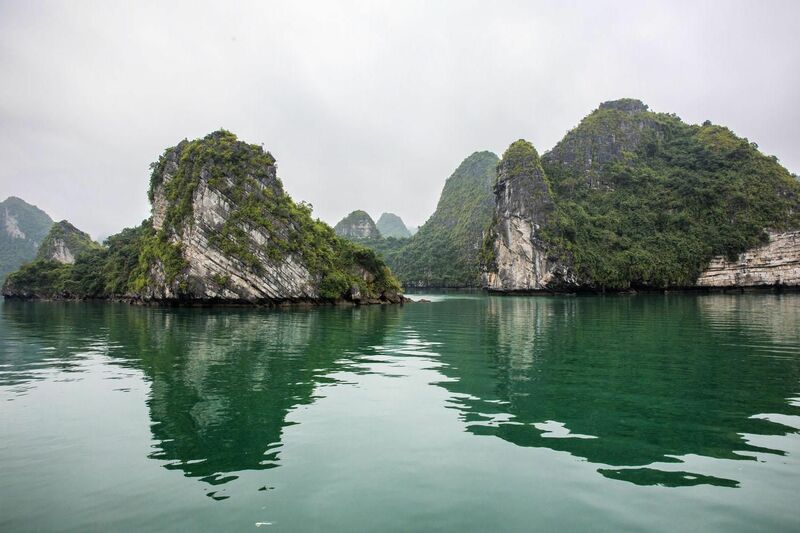 The kayaking was fun, lunch was delicious, and even with the clouds and fog, Ha Long Bay is gorgeous. It was only a twenty minute ride back to our Galaxy Cruise ship. On board we showered and then went up on the deck to enjoy the views. The sun was out now, lighting up the sky and the mountains. Beautiful. It was 5 pm and the sun was just beginning to set. What a fabulous day! The dinner menu was very similar to last night’s. Once again we passed on squid fishing and karaoke, choosing the solitude of our rooms. Normally we are up for anything but here it just felt nice to relax. On the third day of the cruise we awoke to clouds and rain, but no fog, a huge improvement. After breakfast the sun peaked out from behind the clouds and slowly the clouds began to drift away. We would have sunny skies on our final day, for which we were very thankful. The four of us and most of the people on our boat went for a tour through the Me Cung Cave. Our tiny, young, and very enthusiastic guide, Happy, had us crawling through all kinds of tunnels and tight spaces. We felt like we were back in the Cu Chi Tunnels again. It was tons of fun for Tyler and Kara, the perfect size for exploring this cave, but it was much more difficult for big guys like Tim. But Tim is really just a big kid and he had tons of fun as well. 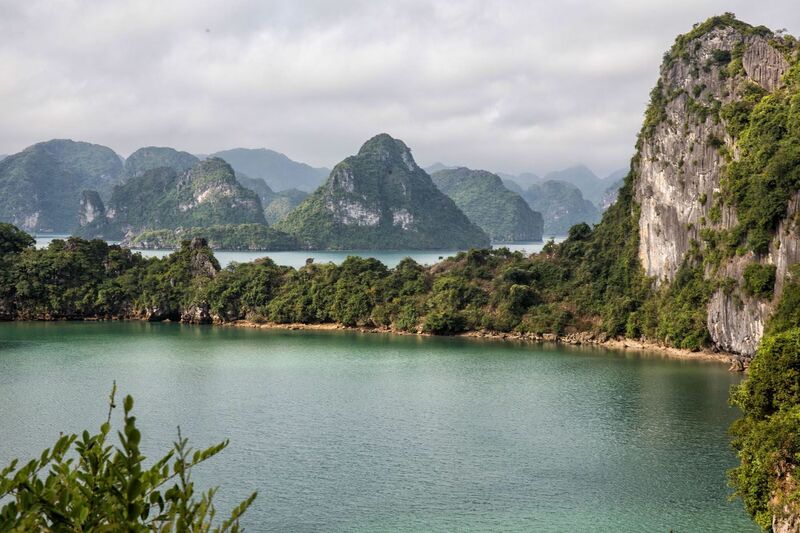 From the mouth of the cave, a short uphill walk took us to a viewpoint over Ha Long Bay. The views were awesome and we were so fortunate to have sunny skies for this. If we had done this yesterday we wouldn’t have been able to see anything. Our three day tour ended with a one hour cruise back to the pier and lunch on board the boat. We took the same shuttle back to Hanoi, arriving at our hotel at 5 pm. 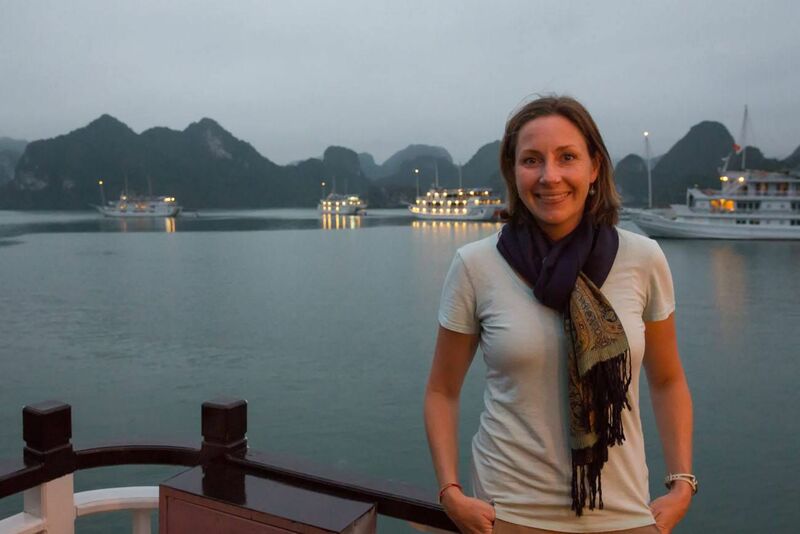 The cruise on Ha Long Bay was wonderful and is probably the highlight of Vietnam for our family, although Hoi An is a close second. It started off dreary and awakening to fog on our first morning was a bit of a let down, but it was still a beautiful, enjoyable experience. The tour itinerary kept us busy, with activities like kayaking, tai chi, cooking, squid fishing, and karaoke. It is impossible to get bored. 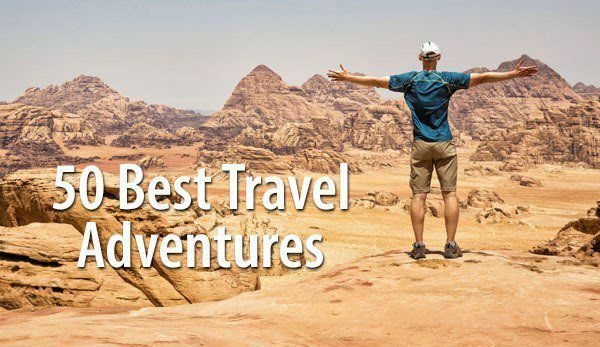 The staff on board made sure that everyone was always comfortable and having a good time, and the accommodations were very clean and comfortable. 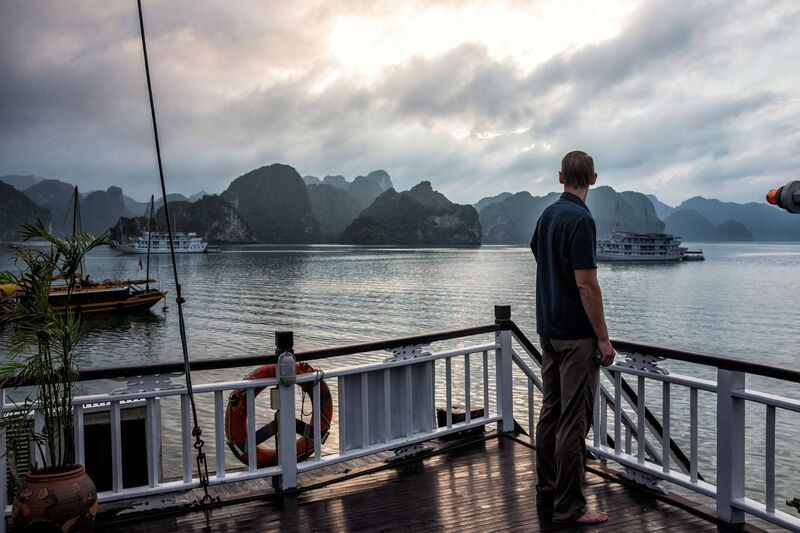 My only real complaint has nothing to do with Galaxy Cruise Lines but with the cleanliness of Ha Long Bay. The amount of trash floating in the water was appalling. We were told that the fisherman who work here carelessly throw their trash into the harbor, polluting this absolutely beautiful part of the world. 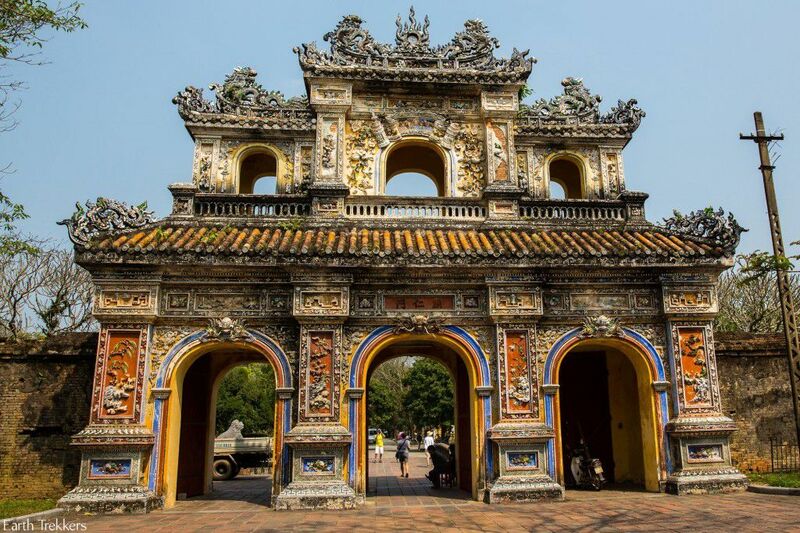 The Vietnamese government is trying to stop this by moving the fisherman on land, offering free housing and free schooling for their children. Hopefully this will work, although I do wonder how fisherman will be able to work by living on the land. It is very distressing to see such a beautiful place treated with such carelessness and disrespect. 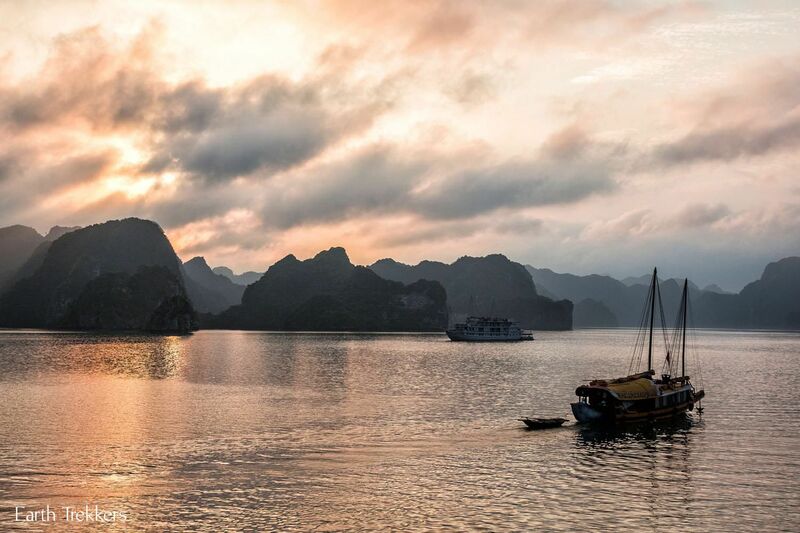 The best time of year to visit Ha Long Bay is between the months of September and December. The skies are clear at this time of year and the summer heat is fading away. From December through March the skies are overcast and drizzly and temperatures are cooler. In February, our average daytime temperature was 23° Celsius (about 74° Fahrenheit), very pleasant, but not quite warm enough to go swimming. 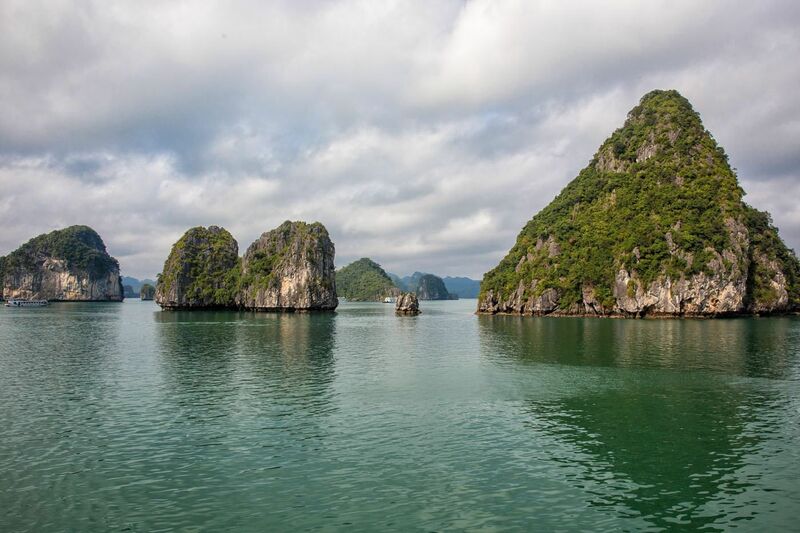 In April the skies clear but Ha Long Bay really begins to warm up. During the summer months we were told that temperatures can reach up to 38° Celsius. Two Day Cruise or Three Day Cruise? 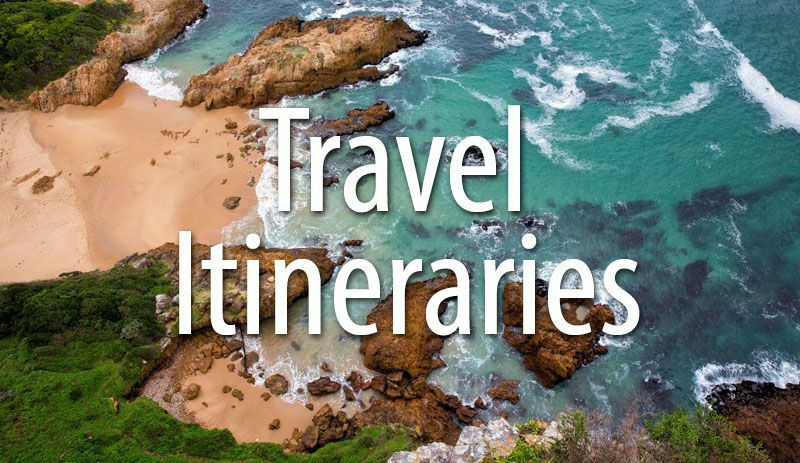 Most companies offer two day cruises and three day cruises. The three day cruise allows people to travel farther into the bay, getting away from all of the boats that only make the two day cruise. 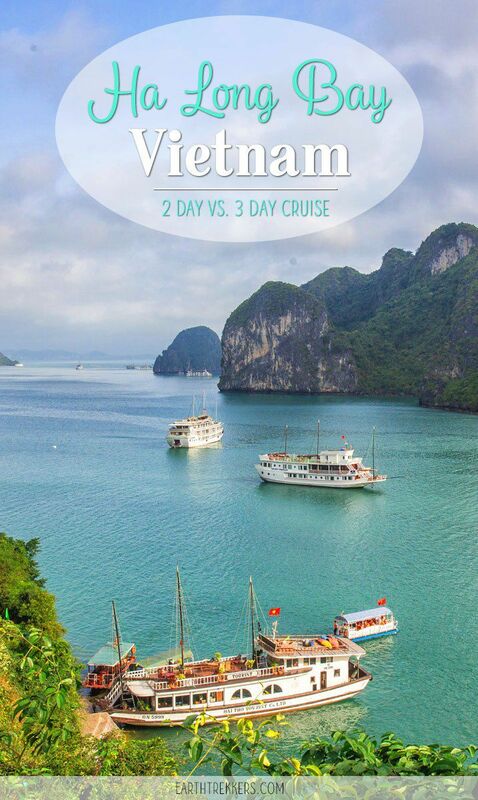 A two day cruise only gives travelers the afternoon of the first day and the morning of the second day on Ha Long Bay, with a four hour van ride both days. 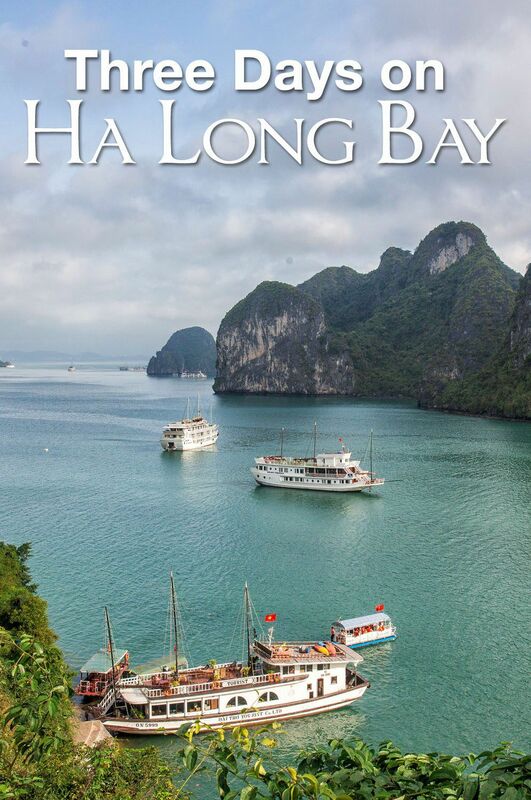 In my opinion, this is hardly enough time to get to really enjoy Ha Long Bay. If you have the time in your schedule, the three day cruise is worth it. 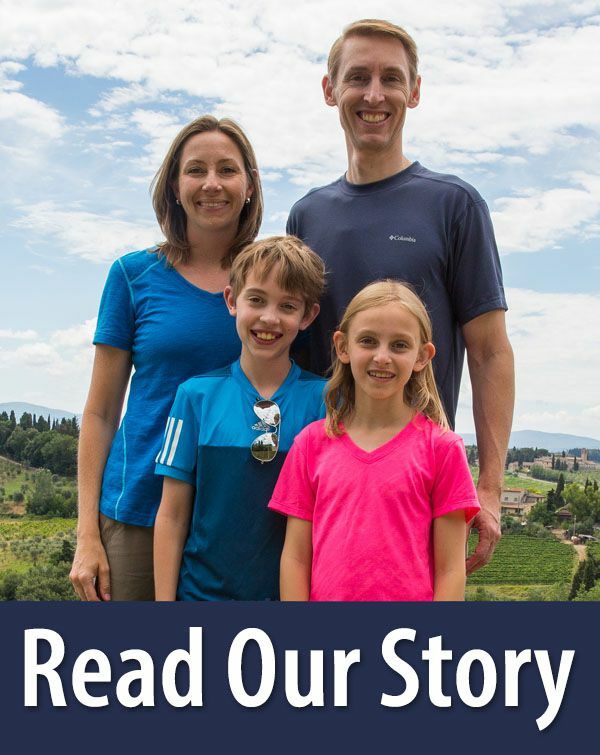 We would have missed so much if we had only taken the two day cruise (such as the trip out to the swimming area, the highlight of the cruise for our family). 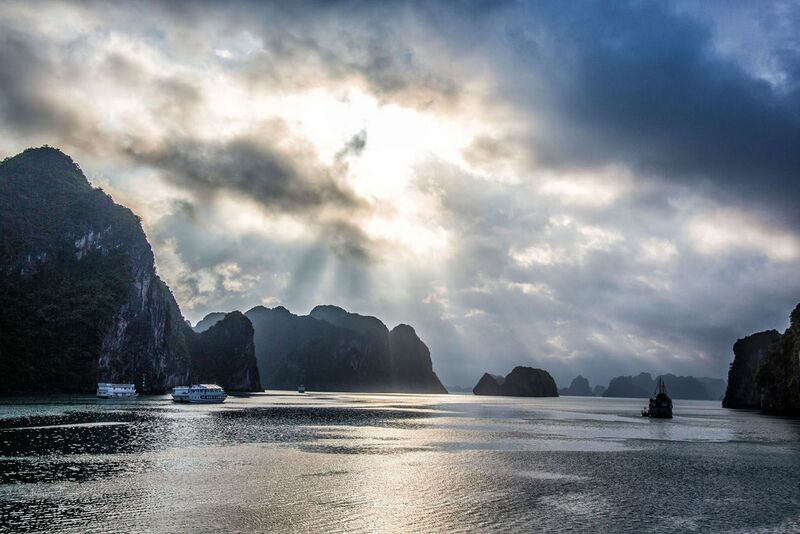 Ha Long Bay is one of Vietnam’s most beautiful destinations and is not to be missed when planning a holiday here. Enjoy! 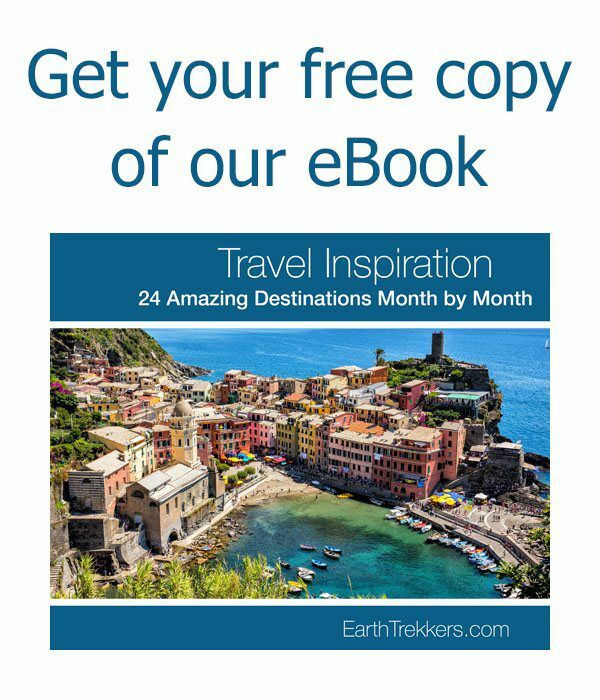 Note: We received a discount on our cruise with Galaxy Cruise Lines to write this article. As always, our opinions are 100% are own. 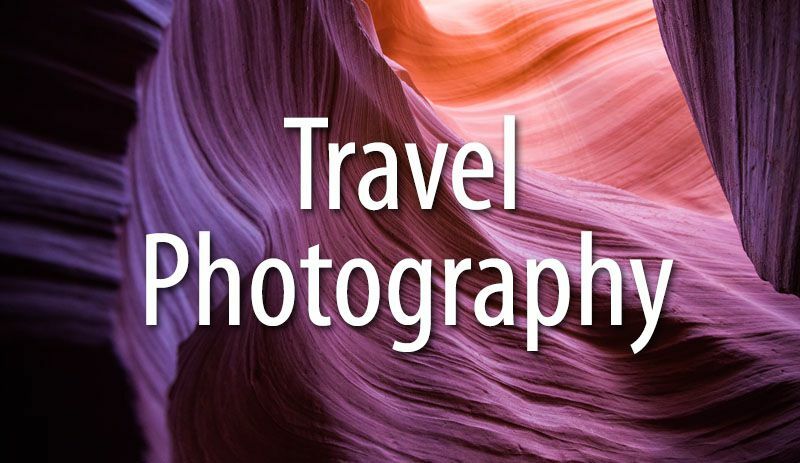 It was great to find your blog; nice pictures & helpful tips! This is really useful. 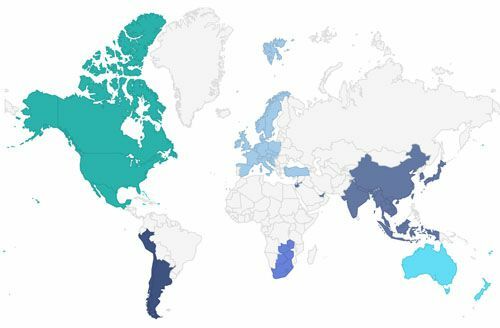 Hope that you will provide us with the more interesting articles about this beautiful country. Thank you so much! !